John Brown, a successful yuppie living in 1980s San Francisco meets a romantic interest in Liz, after placing a personal ad in the newspaper. From this interaction, John meets a variety of characters, each with their own values and ideas of “self-actualization." However, Liz begins to fall in love with John’s best friend, and John realizes his journey of self-discovery has only just begun. Vikram Seth's books include three poetry collections, a libretto, the travel memoir From Heaven Lake: Travels Through Sinkiang and Tibet, and the novels The Golden Gate and A Suitable Boy. Born in Calcutta, Seth has lived in China, California, England, and India. "At once a bittersweet love story, a wickedly funny novel of manners and an unsentimental meditation on mortality and the nuclear abyss. Always witty--and still profound--the book paints a truthful picture of our dreadful, comic times." "A splendid achievement, equally convincing in its exhilaration and its sadness." "The great California novel has been written in verse (and why not? 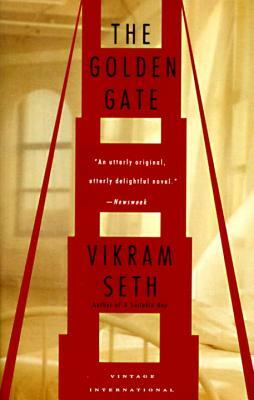 ): The Golden Gate gives great joy."